Try this new twist on a Roast Chicken Salad Sandwich. 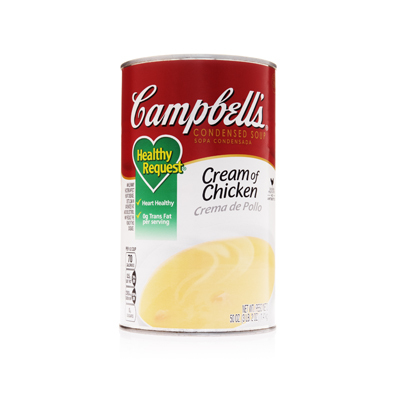 Combine Campbell's® Healthy Request® Condensed Cream of Chicken Soup, roasted chicken, iceberg lettuce, tomatoes and white bread to get a delicious sandwich perfect for any lunch or bar menu. black pepper, cracked	 4 tsp. 1. In large bowl, combine soup, mayonnaise, lemon juice, pepper and salt. With a wire whip, whisk well to blend. celery, diced 1/4-inch	 4 1/2 qt. 2. Add chicken and celery, mix well. CCP: Refrigerate below 40°F for service. iceberg lettuce, medium-sized leaves	 100 ea. tomato slice, thin	 200 ea. 3. For each serving, portion 1 lettuce leaf, 2 slices tomato and 4-½ oz. chicken salad between 2 slices of white bread. Cut diagonally.